Last weekend, while jogging with my husband, an idea came to me: Why not go to Death Valley today? I had been seeing multiple posts about the fantastic wildflowers, products of October flooding. One friend who works in Death Valley said it's the best she's seen since she's been there, which is about fifteen years. I didn't have anything too pressing at work, it was only about six hours away, and I had the energy and desire. So I asked my husband if he would mind if I went. He said fine, and thanks to friends Nomi and Jenny, the kids were taken care of after school. I had packed quickly and meant to leave early afternoon Sunday, but was having so much fun with friends on a bike ride that I didn't leave until 4:30 p.m. That worked out fine, I saw a beautiful moonrise near Ely, listed to a great audiobook, Duplicity, and before I knew it was in Beatty, Nevada. I decided to go a little further so I could get to the flowers even faster the next morning. That turned out to be a great decision. 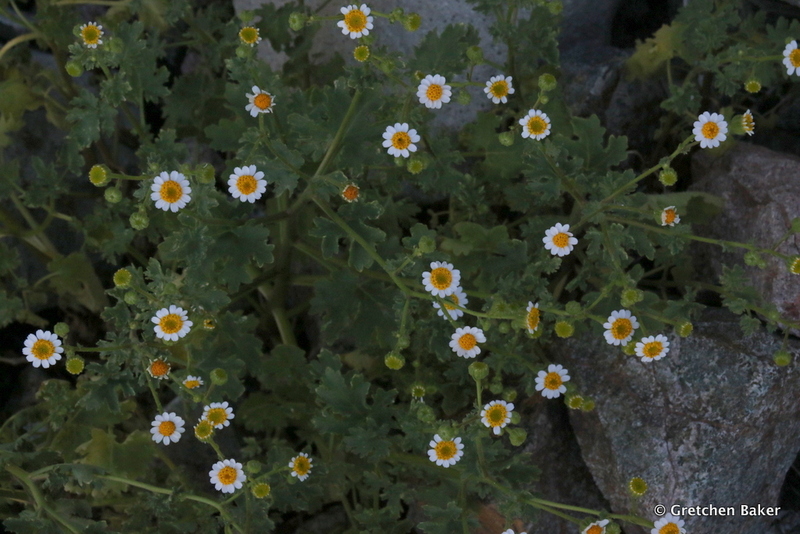 The upper elevations didn't have many flowers, but were beautiful (see photo above). But as I descended along the Beatty cut-off road, there was a cacophony of flowers. Because I had a very loose itinerary, I just stopped where ever I wanted, climbed various hills, and snapped lots of photos. I bent low and smelled the flowers--delicious! Although the yellow Desert Gold (Gereae canescens) flowers dominated, there were many others, at least 12 species along this road. I wasn't the only one stopping. It seemed when one vehicle pulled over, others would stop too. It reminded me of the "bear jams" we used to see in Yellowstone. I was now experiencing "flower jams." Fortunately, the shoulders of Death Valley roads are graded so it's very easy to pull all the way off the road. The mountains in the background are hazy because it was extremely windy, blowing the sand from the dunes near Stovepipe Wells down the valley. I stopped at Furnace Creek for a while, including a $16.95 hamburger at the cafe that was totally worth it, one of the best I've ever eaten. Then I headed further south, where the report was that the flowers were excellent. 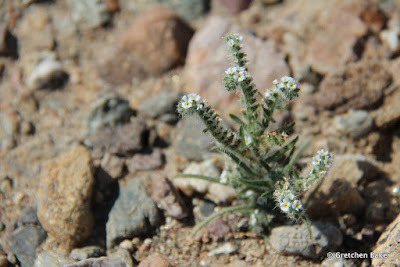 When I got to Badwater, the lowest spot in Northern America at -292 feet elevation, I didn't expect to see any flowers. 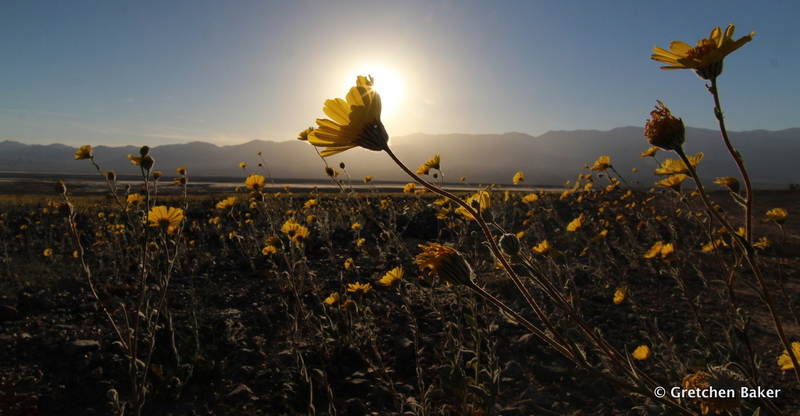 But on the edge of the road, overlooking the salt flat, flowers bloomed, creating an amazing juxtaposition. I took some time to look at some of them in more detail, like this Gravel Ghost (Atrichoseris platyphylla), which seems to float in air above the gravel due to the camouflaged nature of its stem. And these purple flowers made beautiful patterns. The Desert Gold made fields of gold. Some of these fields extended over entire alluvial fans. Which, when you think about it, is so remarkable. There is practically no soil on these alluvial fans. 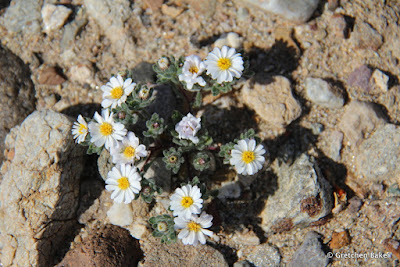 These flowers are growing out of the gravel. And in just a few weeks (or less, depending on weather conditions), the alluvial fans will be back to their normal grey and brown colors. I tried to find a different way to get a photo. After all, how many fields of flowers did I need to take? (I did take over a thousand photos on this two-day trip!) The afternoon light was just stunning. I kept heading south, in a race against the setting sun. 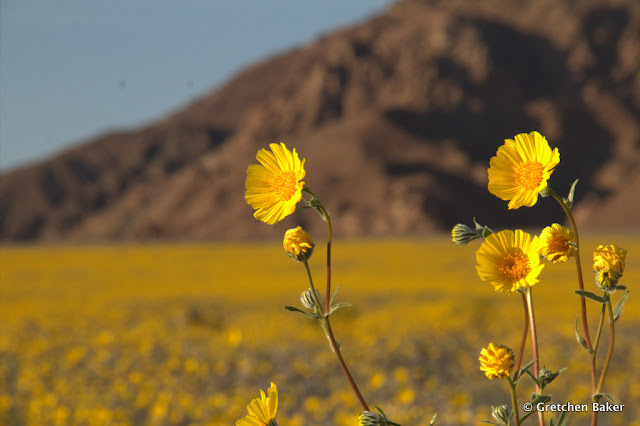 The dark colored mountains contrasted with the yellow flowers. I started thinking of them as "hairy hillsides." 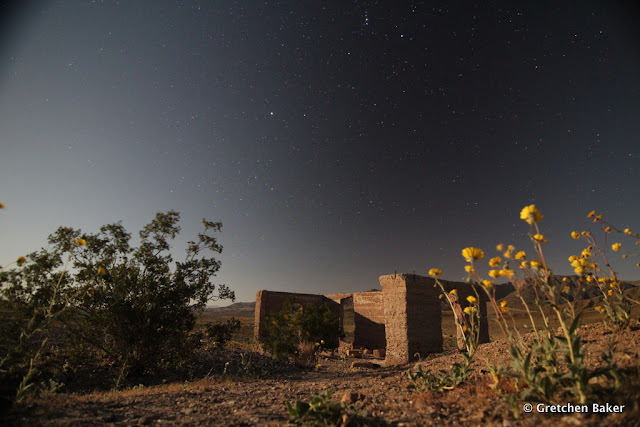 I arrived at Ashford Mill Site, where I tried to get some shots of the rising moon (not so successful) and of the moonlit ruins and flowers under Orion and Canis Major (a little better). This looked like a great place to be in the morning, and when two SUVs full of photographers joined me the next morning, I knew I was right. A few clouds provided a very nice sunrise. The full moon was setting as the first light hit the tops of Telescope Peak and the other mountains. It was dreamy. And then there was a little reality check. 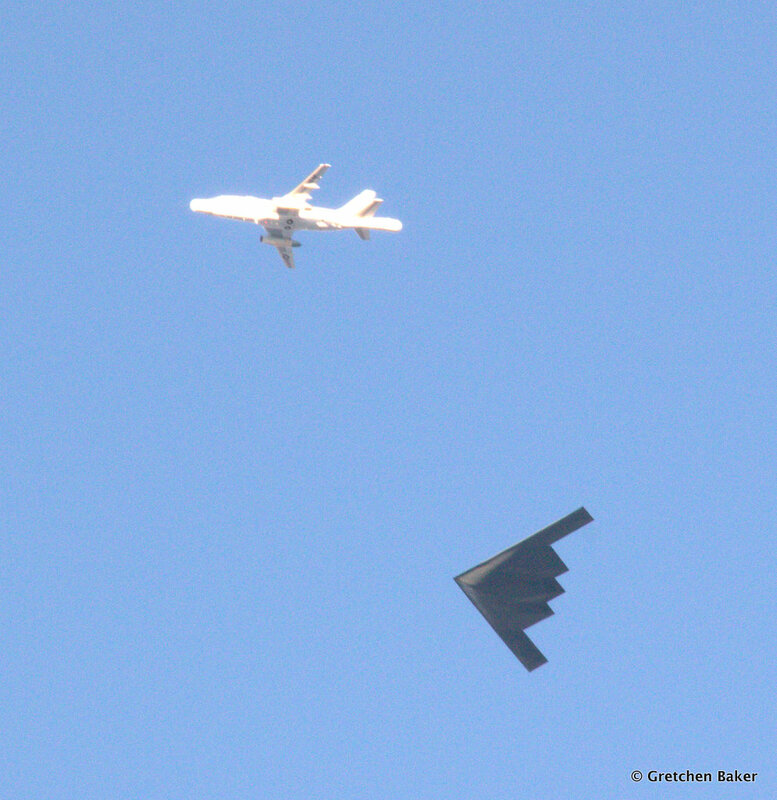 A Stealth bomber flew overhead with an accompanying jet. They made a few laps up and down the valley. The afternoon and morning light are definitely the best for photography. After my second morning photographing flowers, I went for a bike ride, hike in a canyon, and a swim at Furnace Creek ($5 to get a pool pass for the day!). Then it was time to head home. The trip was quick, but totally refreshed me. Seeing the beautiful flowers growing in such a desolate place revealed more of the beauties of our planet and made me feel so alive. 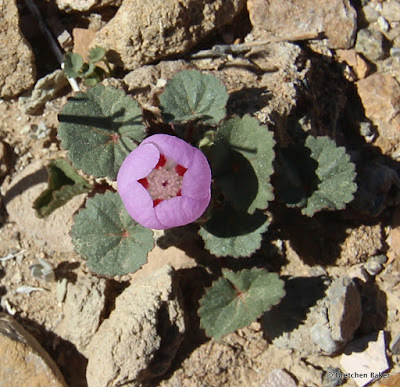 If you'd like to know more, the DesertUSA has a Death Valley Wildflower Report has more info on what's blooming now. The Ely Outdoor Enthusiasts resurrected the Bristlecone Birkebeiner, a cross country ski race. They have cool photos on their Facebook page from past Birkebeiners. Birkebeiner is a name for a cross country ski race, with its origins going back to the year 1206, when the 18-month old illegitimate son of the King of Norway was smuggled to safety in a backpack by soldiers on cross country skis. For some Birkebeiners, racers carry backpacks with a weight simulating the infant. You would think that with how cold Ely is, it would be easy to hold a cross country ski race, but it seems that warming trends and lack of snow the past two years have made it really difficult. This year the organizers set the date and said the race would be held no matter the weather--if it was warm, it would just be a mud run. That made it much easier to plan and save the date. Fortunately the weather was great, and over 30 people turned up with their skis. The long race (12.2 km) started at 9 am, and then the short race (6.1 km) lined up to start five minutes later. The race was held at Ward Mountain Recreation Area near Ely. I had never done the loop, so it was fun to see what the course was like. Most of it was a narrow path through pinyon and juniper, siwht some open areas. When we started the race, there were some people who took off so fast I didn't even know it was possible to move that fast on skis! I shuffled along, hoping to finish in time to see the kids' race, which would start 55 minutes later. The race had lots of little ups and downs. I crashed on one turn at the bottom of a little hill since I didn't want to ski into the sagebrush. I wasn't exactly smooth, but I really enjoyed being outside and getting some exercise. My friend Brooke finished ahead of me and got this photo of me near the finish--in about 55 minutes! Woohoo! I went up to the Kid's Ski route, a 1-km out and back. They had started it just a few minutes earlier (I needed a few minutes to recover at the end of my race), so it took a while to catch up to the kids. But I eventually did, finding Desert Girl in her tutu and Desert Boy with a very determined look and not minding that one of his boots wasn't very secure in the ski binding. They both wanted to win a ribbon for being in the top three, even though they had very little experience with cross-country skiing (like two practices and that's about it). They fell a lot and complained some, but they kept moving. Desert Girl got passed and at the end was very frustrated because she finished fourth. It was a hard lesson for her to learn, but a good one, that you can't always win (and as a six-year old in her very first cross-country ski race, she shouldn't expect to!). I tried to emphasize that just participating and finishing made her a winner. They soon awarded ribbons, and Desert Boy got second for the kids. It was great to see kids enjoying the outdoors so much! We did a photo of all the ribbon winners. I think this girl was the biggest winner of all. She was the last person to finish the course, but she was nine years old and did the 6.1 km race and finished with a smile! Way to go! I asked the kids afterwards if they wanted to do the race again next year. They didn't hesitate to say yes. I think we'll be spending more time outside, so it's already a win for all of us. Thank you Ely Outdoor Enthusiasts for getting us outdoors! Not many people visit Lehman Cave in the winter. That makes it a great time to clean the cave! About 25 volunteers gathered for a weekend in January for the annual lint camp. Lint refers to the particles that fall off our clothes (you know, what you find in the dryer lint trap). Lint is constantly falling off our clothes, including when we're in the cave. But in the cave, there's little wind to blow it away, so it just drifts onto the cave formations and over time makes them look duller. It also provides an unnatural food source for cave biota and can even change how speleothems (cave formations) form. Katie came from Crystal Cave in Sequoia National Park so she could learn how to put on lint camps there. She found a high ledge that had quite a coating of lint and dust. Below you can see the line between what she's cleaned and hasn't cleaned. Some places are very difficult to clean, like in between popcorn. Tiny brushes and forceps work best here. During this lint camp, an old hot cocoa mix was found in the cave. Who would have brought it in? And how long ago? Fungi and springtails were still deriving some nourishment from it. A tiny gray springtail is in the photo below, inside the blue O. We also lucked out and found a larger cave creature, a pseudoscorpion. This one is endemic to the South Snake Range. It's a predator, at the top of the invertebrate food chain in the cave. But it's only about an inch long. Families regularly come to the lint camp, and it's neat to see how they all work together. In addition to cleaning lint, another big job during the weekend is restoration. That means removing old trail debris to find the natural cave floor. Buckets are quickly filled up and it's cool to find popcorn or rimstone dams under the sand. Even the ceilings need to be dusted! It's not as easy as at home, though, due to all the soda straws and stalactites. We had a group of kids who worked really well together. Plus they are so close to the floor that it's easy for them to see things adults might not. On Saturday afternoon we gathered for a group photo. We were waiting for a few people, so I decided to have some camera fun. I told everyone to move their lights around during a long exposure. Next up was a reward for all the hard work, a tour of the Talus Room, an area of the cave that's usually off limits. It's a humongous room, more than a football field long and with the ceiling more than 100 feet tall in places. The next day it was back to work, but for some folks in a different area of the cave. People often get attached to a particular spot they're working on, and if they don't finish it, want it saved for them for the next lint camp. The amount of dedication is amazing. The work can be tedious, but it is rewarding. Here are some newly uncovered rimstone dams in the Gothic Palace. They had been covered up for decades, and now everyone can enjoy them. Lint camp kind of turns cleaning on its head--in the cave it's a fun thing to do! Update: Here's a great article in The Ely Times by Ross Johnson about lint camp.